We Take Food Very Seriously. Along with the sites and itineraries, good food plays a key role in the design of all our tours and cruises. For us, meals are much more than a practical necessity: they are a pleasure to be shared with our guests, and moreover a central aspect in experiencing the local culture and the area’s gastronomic wealth. In that sense, each of our itineraries, whether it’s one of our specific food tours or one of our general trips is a culinary exploration. On our gulet cruises, the on-board chefs freshly prepare a wonderful variety of dishes in the ship’s galley using fine local ingredients. 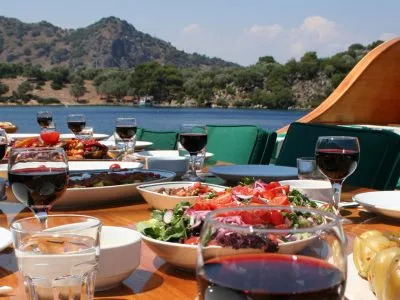 These daily delights are complemented by shore meals in excellent and atmospheric restaurants and tavernas along the itinerary. If gastronomy is a special interest of yours, you should join one of our designated culinary itineraries – but every one of our tours is a pleasure for all the senses! Mediterranean wine culture goes back to the Bronze Age and was a central aspect of Greek and Roman life, society and culture. Today, wine still holds a distinctive and evocative role in the areas we travel. 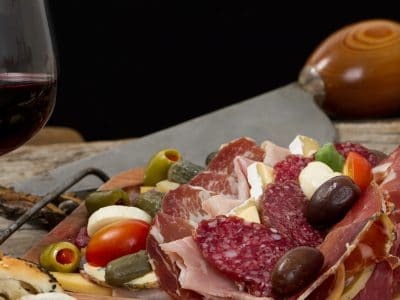 Italy is famed for its venerable vintages; Greece has recently rediscovered and redeveloped its ancient tradition of advanced viniculture; Turkey has a fledgling but dynamic wine industry. On all our tours, we serve a select range of wines representing the products of the country we travel. When we visit wine-producing regions, we also organise wine tastings at hand-picked estates, for example in Cappadocia, on Santorini, in Northern Greece and in Sicily. It is our firm conviction that savouring and enjoying the local wines is a key way to appreciate a region’s culture – an experience we love to share with our guests. For the “foodies” among our guests, we offer a growing range of special gastronomy-themed tours and cruises. Like all our trips, they are centred on expert-guided visits to important and beautiful ancient sites. At the same time, our food tours offer you a deeper and more hands-on engagement with the local culinary tradition. By exploring local markets, picking wild foods, visiting traditional producers and participating in the preparation of delicious meals, you will gain a profound insight and specific knowledge of a region’s culinary culture. Average rating 5 out of 5 from 372 reviews for Food Tours, according to AITO reviews. 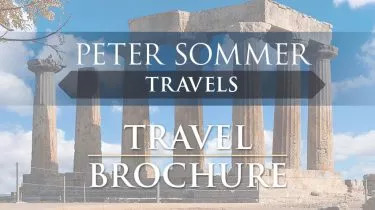 Our family had been looking forward to travelling with Peter Sommer Travels for years. Finally the kids were old enough, and we went....and it was everything we dreamed it would be and more. Relaxing, educational, a gorgeous boat, the most delicious food, beautiful scenery, and we made such good friends. Now my two boys want to be archaeologists when they grow up! To say they got a lot out of the tour would be a massive understatement and it was THE educational experience of a lifetime! We can't wait to come back for another family tour!